This web site is dedicated to the collection and redistribution of professional news and analysis that the commercial media routinely ignore. It aims to provide global analysis of trends and processes, in a media world that is increasingly centred on events. 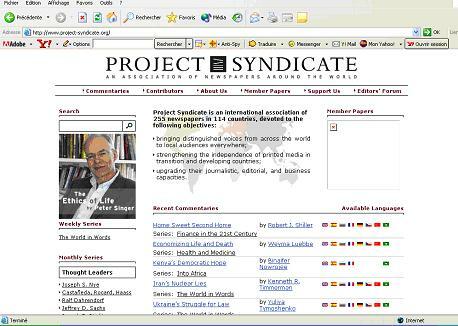 Project Syndicate is a not-for-profit international association of quality newspapers. It aims to bring distinguished voices from across the world (including academics, economists and activists) to local audiences everywhere and to strengthen the independence of printed media in transition and developing countries. The site describes the monthly commentary features available to interested media sources. A lot of this content is made equally available on line to the general public as well. The vast majority of articles are available in 8 languages: English, Spanish, Russian, French, German, Czech, Chinese, Arabic, and occasionally Japanese. 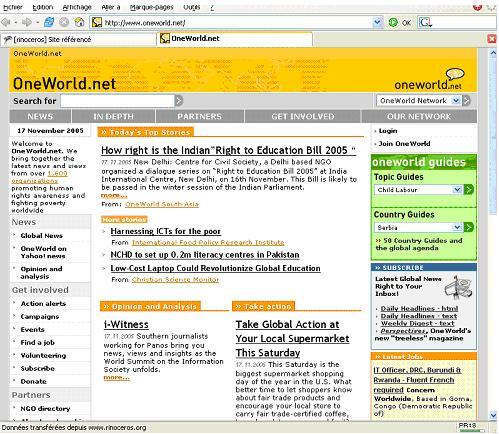 Launched in 1995 to give a voice to people and organisations involved in development and human rights, OneWorld id today the leading civil society network online, supporting people’s media to help build a more just global society. Recollecting information from more than 1.600 organisations around the world, its website provides news and analyses. Common Dreams is an eclectic mix of politics, issues and breaking news with an emphasis on progressive perspectives that are increasingly hard to find. 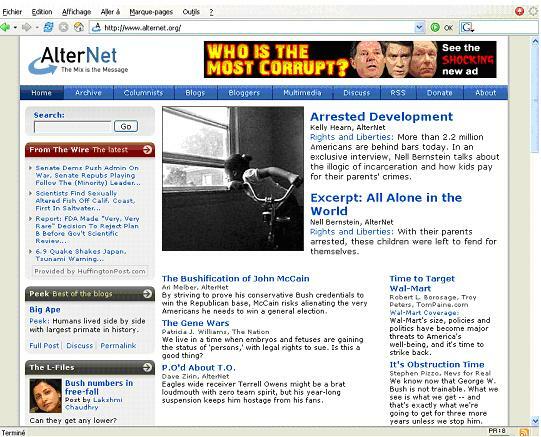 It supports the Progressive NewsWire, which brings the press releases and the statements from America’s progressive community. 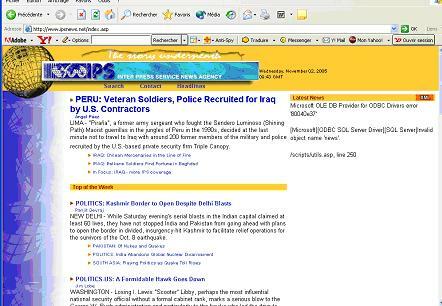 IPS was set up in 1964 as a non-profit international cooperative of journalists. It is an international, not-for-profit association of professional journalists and others in the field of communications. It has no national or political base and pursues the objectives of balanced geographical, ethnic and gender representation. The website for the Inter Press Service News Agency has up-to-date news alerts, with a focus on developing countries in the South, as well as more in depth articles and dossiers. 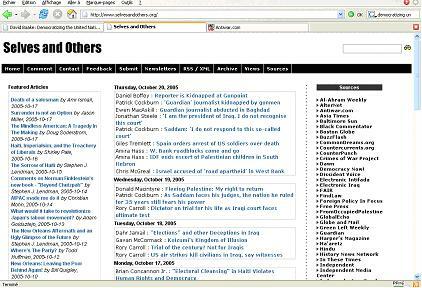 Since the Summer of 2004 SaO is providing extensive daily compendium of views found on various sources on the Web, while also providing the readers with an extensive archive of past views and sources. SaO also publishes the works of free-lance writers as well as interviews. These works can be in the form of articles, interviews, book/film reviews, or opinions/viewpoints. 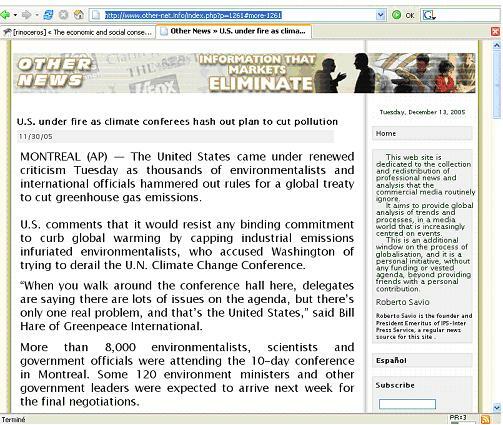 The Independent Media Center, was established by various independent and alternative media organizations and activists in 1999 for the purpose of providing grassroots coverage of the World Trade Organization (WTO) protests in Seattle. 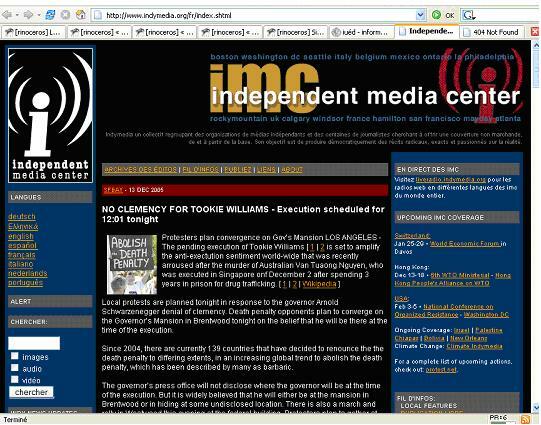 The Independent Media Center is today a network of collectively run media outlets for the creation of “radical, accurate, and passionate tellings of the truth”.